Remove papery outer layer from garlic, leaving skins around the cloves intact. Slice off the top of the garlic head, 1/4 - 1/2 inch, exposing the tops of the cloves. Place garlic on a piece of foil, drizzle with oil, and use your fingers to coat. Wrap foil tightly around garlic, enclosing it completely. Place in a baking pan. Meanwhile, bring a large pot of water to a boil on the stove. While waiting for the water to boil, peel and cube the potato. Add potato and cauliflower to boiling water. Return to a boil, and then reduce heat to medium. Cook until potato and cauliflower are very tender, 15 - 20 minutes. Drain water and transfer potato and cauliflower to a large bowl; set aside. Once foil-wrapped garlic is cool enough to handle, unwrap garlic and remove cloves; discard skin. Add the soft cloves to the large bowl. To the bowl, add half & half, butter, and salt. Mash it all together with a potato masher, until completely blended. If you like, season to taste with pepper and additional salt. If needed, bring to desired temperature in the microwave or oven. Top with chopped chives, if you like, and enjoy! One of the most popular and hard-to-resist side dishes EVER is mashed potatoes. Even more irresistible? Creamy, buttery, roasted-garlic mashed potatoes. Sadly, these smashed spuds have pretty heavy calorie and fat counts. A side order at Outback Steakhouse will cost you 305 calories and 17g fat; at Applebee's, 330 calories and 18g fat. That's especially loony since it's just an accompaniment to the main part of your meal! For our version, we used our go-to trick of mashing in cauliflower with our potatoes. We also added some real roasted garlic... that we roasted ourselves. It's so easy, and you can totally do it too. 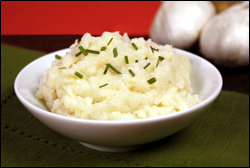 So the next time you're scanning a menu and see garlic mashed potatoes, have a chuckle and think about how you JUST had guilt-free garlic mashed potatoes... at home. 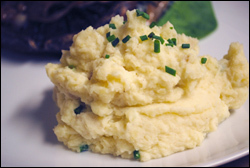 Click "Send to a Friend" to pass along this email -- your mashed-potato-loving pals need it! Happy National Cappuccino Day, also known as November 8th! A 12-oz. (Tall) nonfat cappuccino from Starbucks has only 60 calories. SCORE!